See Your Message On The Scoreboard! 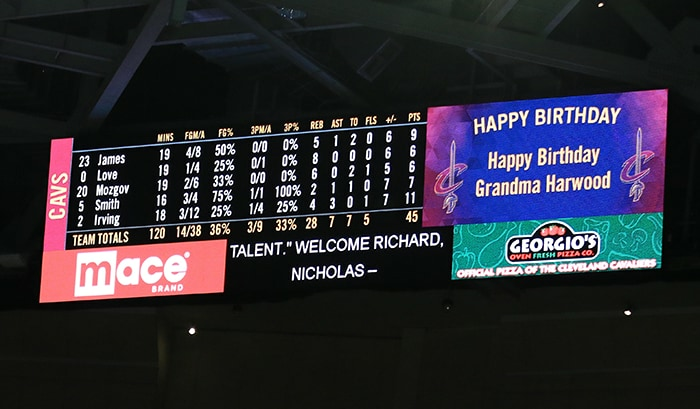 Fans can score big with a personalized scoreboard welcome, Happy Birthday or Happy Anniversary message at a Cavaliers home game at Rocket Mortgage FieldHouse! Gain extra points with the fact that you're also supporting the Cavaliers Youth Foundation along with local children, families and young adults. A donation of $25 to the Cavaliers Youth Foundation will be charged for every Cavaliers Scoreboard Message. If you are a Wine & Gold United Member or Suiteholder, the $25.00 fee will be waived if your request is submitted to your account rep.
Only a limited number of messages can be shown during a game and will be determined on a first-come, first-served basis. A receipt will be mailed to the address listed on all donations that are processed. Messages will appear at the start of halftime on our 4 color LED corner boards located in Loudville. See it in action. No cryptic messages or unusual nicknames will be posted. Your information will be processed securely to our servers.